The Rails hosted the Carroll Tigers at home on Thursday (12/6). The team had an uphill battle, after a varsity team member suffered a non-athletic injury just the day before. But the guys didn’t let that setback deter them. The entire team adapted to a modified line-up and raced hard right from the start. Despite their effort, the Tigers jumped to an early 34 to 28 lead after winning three of the first four events. After the first break, the Rails won the 100 Fly, but still trailed 43 to 51. However as the 500 Free got underway, it was clear the Rails were aiming to turn the tide! Gabe McCollough won handily in 5:47.95. But Trystan Thomas and Tyler Skalicky raced to 2nd and 3rd respectively – with a 6:06.65 and 6:06.91, a personal best for Skalicky! The 1, 2, 3 finish earned the Rails 13 points in that one event and gave them their first lead of the night 56-54! After that, the competition heated up. 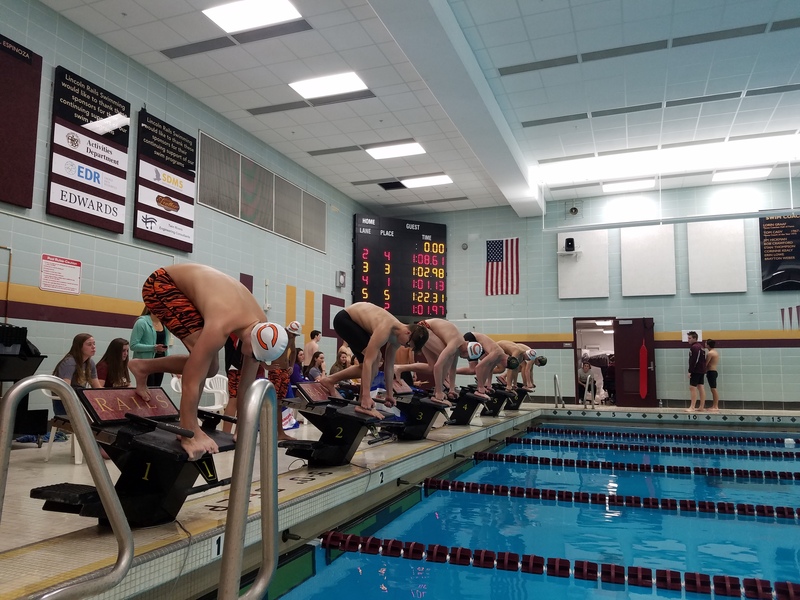 The Rails took 2nd and 4th in the 200 Free Relay resulting in another lead change – 64-60, Tigers advantage. But following the 100 Back and another lights out race in the 100 Breaststroke, which featured an untapered best and two personal best swims, the meet was tied 78 all! The winner of the last event would be the winner of the meet. As the 400 Free Relays dove in, it was tight race for the first 200 yards, but then the Rails pulled away winning in a 3:42.46, a 10 second victory! Final score: Rails 88, Tigers 82! And Nicolas Filippelli finished just behind him with 1:20.64! Below are few photos from the meet. Upload your own to the team’s photo website. Log-in required.